We offer Loire Valley private tours with optional wine tasting tours in Loire Valley. Our Loire Valley Private Tours Include: Our Paris day trip of the Loire Valley include private Loire tour guide, private transportation to and from your hotel or apartment, taxes, tolls and parking. Also Included: Entrance tickets to Chambord, Chenonceau and Amboise Royal chateau. 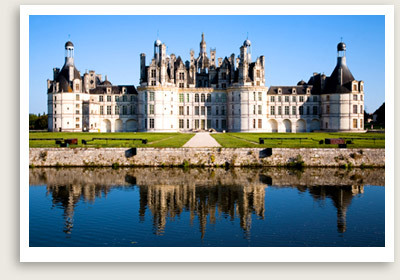 NOTE: Customize your Loire Valley private tour. Our private tours Loire Valley may include two castles tour and a Loire winery tour with wine tasting or another castle of your choice like Villandry or Usse. Other departure points available. Embark on one of our favorite Paris day trips, Loire Valley tours, combining the French countryside views with tours of Loire Valley’s magnificent castles… the making of fairy tales. 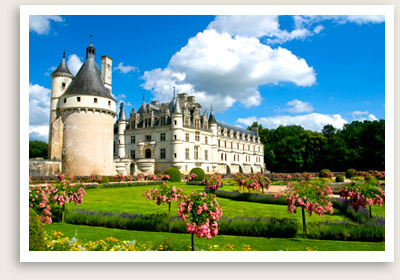 The castles and the beautiful Loire Valley tours are perfect for all ages. Simply an unforgettable touring experience. Your guided Loire Valley tour starts with your English-speaking tour guide taking you on a guided tour of Chateau de Chambord, the grandiose palace of François the First featuring a double-turn spiral staircase designed by Leonardo da Vinci. You’ll tour Chambord’s suite of François the First, the Chapel, the apartments of Louis XIV, and terraces with a magnificent panorama over the vast estate and its many pavilions and slate-roof towers. Your Loire Valley private tour continues on with a drive along the Loire to Amboise, with a glimpse of the Le Clos Luce, the former residence of Leonardo da Vinci. You will visit Amboise Royal Château and its landscape gardens, gorgeous royal apartments and the castle’s chapel which has the tomb of Leonardo da Vinci. After lunch in a typical French restaurant, or perhaps a picnic, your Loire Valley tours continues for guided tour of picture-perfect Château de Chenonceau, an elegant castle built on the Cher River with its beautiful gardens located in the small village of Chenonceaux.